In today's tough economy, it's sometimes difficult to squeeze charitable donations in to an already tight budget. Donations are often easier to justify when you are getting something back for your donations. Breast Cancer Awareness Month offers us a chance to indulge ourselves (which we may not normally do) while giving to worthy causes. Here are a few of my favorite donation-worthy items that will help a woman suffering from breast cancer and won't break the bank (ok, there is one item that will break the bank). Jennifer Aniston models the "Key to the Cure" shirt designed by Emilio Pucci exclusively for Saks Fifth Avenue. The shirt is available at Saks throughout the month of October and Saks will donate 100% of the sales of the shirt to the Entertainment Industry Foundation for Key to the Cure campaign. In addition, Saks will be donating 2% of its vendor sales from October 1 to December 31 to the campaign. Get shopping! To purchase the tee, click here for $35. 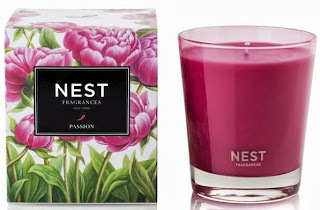 Fill the air with the sweet floral scent of this lovely candle. The clear glass jar is adorned with a light pink ribbon. 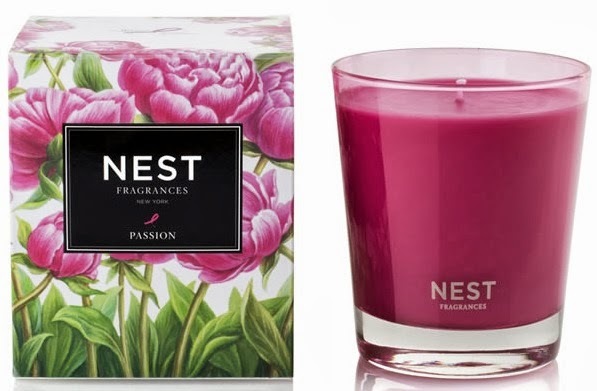 Passion by Nest Fragrances candle retails for $28. 10% of retail price from each candle sold will be donated to The Breast Cancer Research Foundation. It's Time to Find a Cure! You'll never miss or be late for an appointment again with this sporty and trendy watch from Avon. Each over-sized quartz watch features gunmetal plating and a black silicone strap. 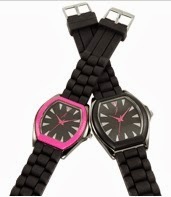 The striking black face has a magenta ribbon and magenta hands.100% of net profits go to Avon Breast Cancer Crusade. Purchase the watch at Avon.com for $20. The 2013 Ford Warriors in Pink scarf is GORG! And you can wear it several ways. 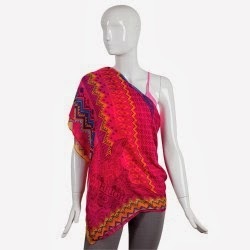 Scarf, sarong, shawl, and more! I love it, and the colors are beautiful. This scarf will match everything. It's a steal at $34! Take a look at the many ways you can where it and order it here. Ford will donate 100% of the proceeds of the scarf to a choice of charities including: Susan G. Komen, Dr. Susan Love Research Foundation, The Pink Fund, or Young Survival Coalition. If you are feeling extremely generous and in the mood to drop some serious cash, why not splurge for a good cause? This A. MAY. ZING bag from Ralph Lauren is made of soft pink Napa leather. I am dying over this bag. Dying, people. 50% of the purchase price of this bag goes to the Pink Pony Fund of the Polo Ralph Lauren Foundation during the month of October. 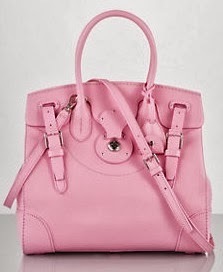 The Pink Pony Soft Ricky bag retails for $2,500 at www.ralphlauren.com. It's worth it, right? I think so.